'Fearless Girl' is on the move, and as usual, Charging Bull is making himself the center of attention. Like Trump, the mere thought of being upstaged by a little woman is way more than his fragile male ego can handle, and 'Fearless Girl' is running out of patience. New York mayor Bill de Blasio announced on Thursday that 'Fearless Girl' will soon be moving to a spot facing the New York Stock Exchange. And even though theirs is a love/hate relationship the mayor would like Charging Bull to shut his whiny mouth and do what's best for the city by going with her. 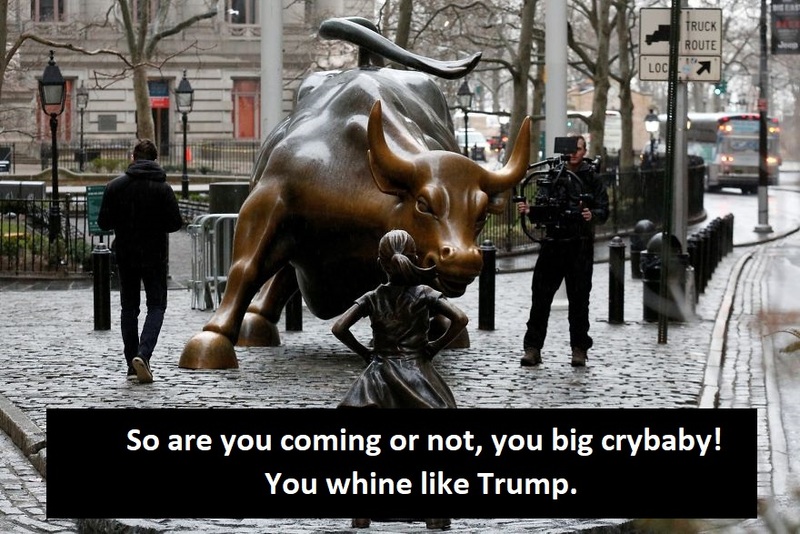 After all, Charging Bull never bothered to get a permit when his owner, the artist Arturo Di Modica, dropped the 7,000-pound bronze bull into lower Manhattan in the dead of night and without permission. Since 'Fearless Girl' arrived with permits and official papers -- after all, Charging Bull is an illegal -- ‘Fearless’, who played by the rules, should have the upper hand in my mind. Isn’t that what Trumplandia says about illegals? In an act of totally Trump, over-the-top ridiculousness, both egos -- the bull’s and Modica’s -- demanded that his illegal beast be turned around, so he didn't even have even to look at 'Fearless Girl'. Meanwhile, Modica’s suing the city over his illegal bull’s alleged mistreatment for goddess knows how many New York bucks. Patriarchal, capitalist forces are clamping down on ‘Fearless Girl’, with her ‘owners’ State Street Global Advisors saying that Fearless cannot go worldwide, unless she flies the State Street banner. A New York federal judge issued a preliminary injunction this week, barring ‘Fearless Girl’s’ birth mother and creator, artist Kristen Visbal, from duplicating her likeness in any way. Simply stated, yet another female has become an unwilling advocate for big-money capitalism and the boys club. ‘Fearless Girl’s’ debut on International Women’s Day, March 8, 2017 inspired us beyond words. The small bronze goddess arrived in the dead of night, originally installed at Bowling Green in another legal battle with ‘Charging Bull’.